This eBook edition of our Code Check Plumbing & Mechanical 5th Edition has been expanded to 124 pages. The book is based primarily on the 2015 IRC and 2015 UPC/UMC codes. 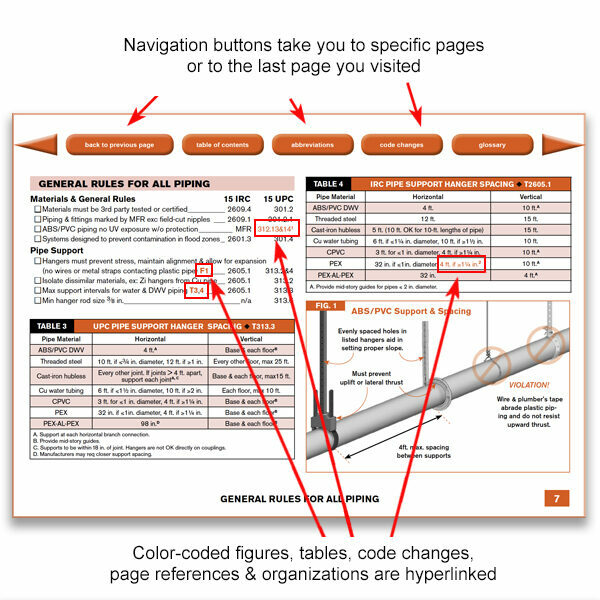 • Includes select California code changes–highlighted and hyperlinked throughout. Essentially contains 2 books in one binding – an outstanding value at $24.95 list price. See sample pages below. Endorsed by the International Code Council. 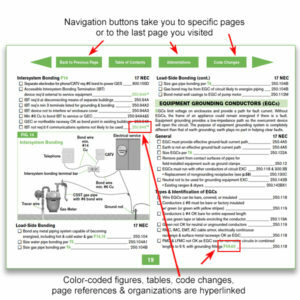 Navigational buttons quickly access a particular page or topic. Referenced figures and tables accessible from Code check text lines. Instant return to previously viewed page. Includes bookmarks, which can be customized. Highlighting enabled for your own personalized versions. NOTE! When you purchase an eBook, the books are not instantly available. Within 20 minutes and up to 12 hours, you will receive an email with links and setup instructions through Adobe Send and Track. Please be sure that your spam filter does not block messages from codecheck.com. Electronic Book Licensing: This CodeCheck eBook is licensed for a single user on up to 4 personal devices. 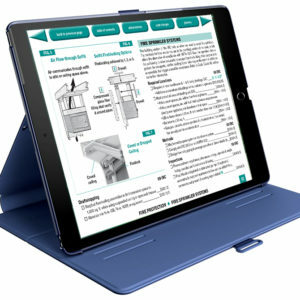 The eBook may be used on one device at a time. This limited license does not allow the installation of the eBook for use in a shared network accessible to multiple individuals whether internal or external. This includes services such as DropBox, OneDrive, etc. If you would like to purchase eBooks for use by multiple individuals, your company, building department, etc. Please contact Licensing@codecheck.com for a quote.